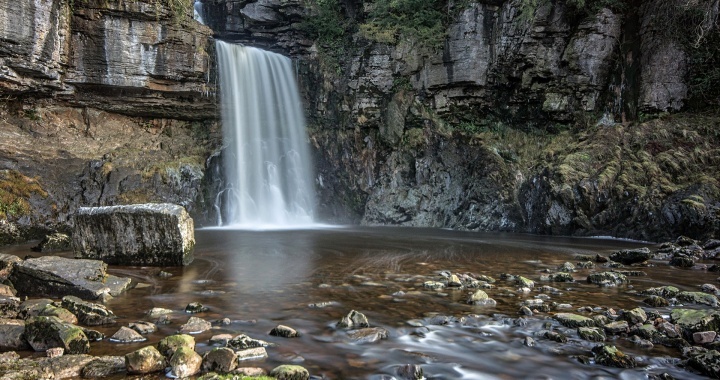 The Ingleton Falls walk is one of the best known and most popular walks in Yorkshire. The walk is on private land, and there is an access charge of £6 for adults. From the Falls car park just outside the village of Ingleton, the walk follows the River Twiss, initially through attractive woodland. After the gorge of Swilla Glen, the path climbs more steeply past Pecca Falls and Hollybush Spout until the highlight of Thornton Force is reached, which is situated in a wide open amphitheatre. At Thornton Force, the River Twiss plunges 46ft over a limestone escarpment in one of the the finest waterfalls in England. The walk then climbs steeply beside the falls to reach open moorland, then follows a farm track with fine views of Ingleborough, until the River Twist is reached. This is followed downstream, passing Beezley Falls, Triple Spout and Baxenghyll Gorge to reach the village of Ingleton and return to the car park. The total walk is about 5 miles long, with a climb and descent of 550ft. From the farm track at the top of the walk, there is a path that climbs higher up the hillside onto Twistleton Scar, which is a fine limestone pavement with views towards Ingleborough. The car park for Ingleton Falls is located just outside the village of Ingleton. If travelling from the west, the falls are signposted at the junction of the A65 and the A687 just before reaching Ingleton. Turn left here onto New Road and follows this for just under 1 mile to reach the car park. From the east, when reaching Ingleton on the A65, turn right onto Main Street, just after the B6255. Follow Main Street for 0.5 miles, then turn left over a pair of bridges over the Rivers Doe and Twist to reach the Falls car park.